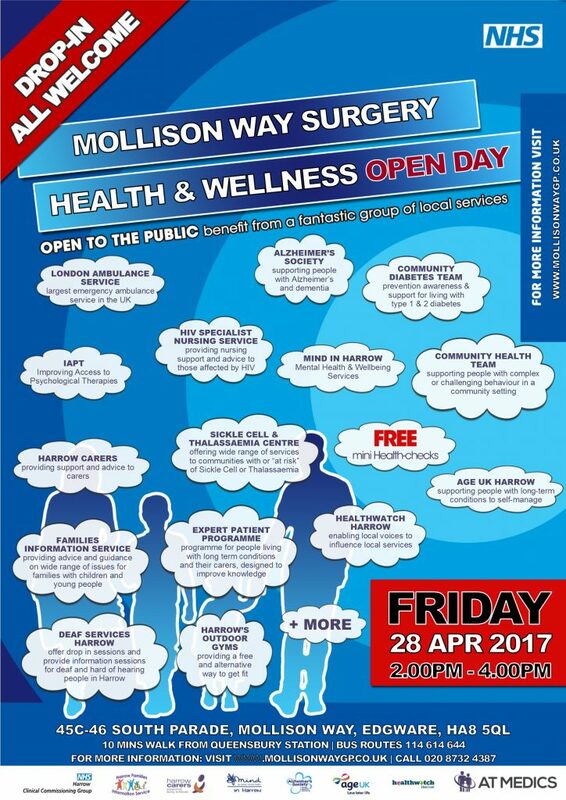 Mollison Way Surgery will be hosting a Health & Wellness Open Day for all members of the public on Friday 28th April 2017 between 2.00pm and 4.00pm – all are welcome to attend. See poster below. The event aims to raise awareness about and allow patients to experience a number of local health and social care service providers accessible through the surgery for our patients as well as other residents of Harrow. The Community Diabetes Team who provide support for people over the age of 17 living with type one and type two diabetes, in addition to coordinating specialist support services such as nutrition, foot care and signposts to retinal screening for house bound patients and patients with learning difficulties. Age UK Harrow aim to maintain older people’s independence allowing them to stay safe and healthy. Sickle Cell & Thalassaemia Centre offers a wide range of services to communities with, or “at risk” or, Sickle Cell, Thalassaemia, G6PD, and other genetically inherited conditions of haemoglobin. At the centre, the highly qualified nursing staff are available to answer questions, provide information, offer blood tests, and give genetic and other forms of counselling on an appointment basis. Representatives from the team will be there on the day to talk to patients and advise them of how and when to access the services they provide. Healthwatch Harrow is all about local voices being able to influence the delivery and design of local services. Alzheimer’s Society offers group support for Alzheimer’s sufferers and their carers. They have a dementia drop-in café every Wednesday from 2-4pm which offers a friendly meeting place for anyone affected by memory loss, dementia or forgetfulness to find support and discuss the challenges facing them. Mind in Harrow is a mental health organisation that started in the 1960’s and has expanded to provide a range of services, from Befriending Services to Youth Wellbeing Projects. Representatives from Mind in Harrow will be present on the day to engage with patients and raise awareness of the mental health services they provide that are available to the local residents of Harrow. Harrow’s Outdoor Gyms provide a free and alternative way to get fit and healthy. The outdoor gyms are equipped with gym and fitness machines that you would find in an indoor gym and are suitable for people of all ages and fitness levels. During the summer months, outdoor gym activators are available to provide support to those looking to use the equipment. A representative from the council will be present at the Open Day to provide information on the gyms and how best to take advantage of them. Brent & Harrow Community Health Team is an organisation committed to providing support for people with complex or challenging behaviour, in a community setting, for Brent and Harrow. Their multi-disciplinary community health teams are made up of community nurses, psychiatrists, psychologists, physiotherapists, speech therapists and a range of other support workers. They provide assessment and treatment to people in their choice of environment and will be present on the day to engage with patients and raise awareness of the services they provide and how to access them. HIV Specialist Nursing Service in Harrow provides nursing support and specialist advice to those infected or affected by HIV regarding physical, psychological and social needs affecting health. They take into consideration the social well-being needs in relation to HIV and its impact on the patient’s quality of life and do their best to provide the necessary support. Families Information Service provides information, advice and guidance on a wide range of services, entitlements, support and activities for families with children and young people. They advise on topics such as childcare provision in Harrow through to early education and childcare funding entitlements. A representative from the organisation will be on hand to engage with patients and make them aware of the services and advice they can offer as a service. AT Medics practices schedule regular PPG meetings with SMS reminders, dedicated PPG notice boards and a translator if necessary, and are delighted to be hosting this event at Mollison Way Surgery. Mollison Way Surgery is committed to delivering high quality care focused on patient needs and safety, and is working to achieve clinical improvement through the implementation and advancement of quality systems, as well as continually reviewing and investing in training and education of staff.